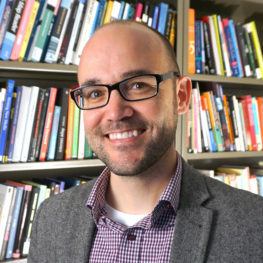 Jason Farman is the Director of the Design Cultures & Creativity Program at the University of Maryland, College Park. He is also an Associate Professor in the Department of American Studies and a faculty member with the Human-Computer Interaction Lab. He is author of the books Delayed Response: The Art of Waiting from the Ancient to the Instant World (Yale University Press, 2018) and Mobile Interface Theory: Embodied Space and Locative Media (winner of the 2012 Book of the Year Award from the Association of Internet Researchers). He is the editor of the books The Mobile Story: Narrative Practices with Locative Technologies (2014) and Foundations of Mobile Media Studies: Essential Texts on the Formation of a Field (2016). He has published scholarly articles on such topics as mobile technologies, the history of technology, digital maps and cultural geography, locative and site-specific art, videogames, digital storytelling, performance art, social media, and surveillance. Farman has been a contributing author for The Atlantic, Atlas Obscura, Real Life Magazine, and The Chronicle of Higher Education. He has also been interviewed on NPR’s Marketplace Tech Report, ABC’s Late Night Live, Radio National’s Rear Vision, ABC News, the Associated Press, the Christian Science Monitor, the Baltimore Sun, the Denver Post, among others. He received his Ph.D. in Performance Studies and Digital Media from the University of California, Los Angeles.